After Mrs. 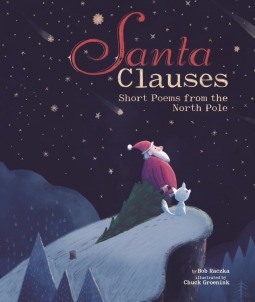 Clause gives Santa a book of haiku poems, he decides to write some of his own. For every day in December, Santa composes a new haiku. Santa describes different aspects of his life throughout the North pole. These traditional Japanese poems take the reader on a journey with Santa to discover all of the many tasks to be done in the month of December. From playing in the snow to delivering presents, Santa’s work is never done. This compilation of Haiku poems is a unique countdown to Christmas. Originally Haiku poems were created to focus on different aspects of nature, but this only applies to a few of the poems in this book. The poems are clever but might be hard for young children to understand. However, the suggested age level given for this book is five to nine years old. All of the illustrations are well done and add greatly to the text.